It's hard to determine if a physician "knows what they're doing" so-to-speak so I tend to look at their training andDr. Ward ticks those boxes and part of her training at Harvard. To me, a doctor's personality and bedside manner are very important and Dr. Ward is excellent and just a very nice person and I could tell she was concerned and very empathetic. She was running a bit late, but was very apologetic and respectful of my time. I was really impressed! It's hard to determine if a physician "knows what they're doing" so-to-speak so I tend to look at their training and Dr. Ward ticks those boxes and part of her trainingat Harvard. To me, a doctor's personality and bedside manner are very important and Dr. Ward is excellent and just a very nice person and I could tell she was concerned and very empathetic. She was running a bit late, but was very apologetic and respectful of my time. I was really impressed! Waited a little while after I went back to the exam room to see the doctor, but otherwise everything was prettyquick. Dr. Ward's beside manner was very good. She was knowledgeable and I never felt rushed. I had actually scribbled some notes down that I hadn't brought up in conversation and when she came over to examine me, so actually asked about, which shows an attention to detail I certainly haven't seen with most doctors. Waited a little while after I went back to the exam room to see the doctor, but otherwise everything was pretty quick. Dr. Ward's beside manner was very good. She wasknowledgeable and I never felt rushed. I had actually scribbled some notes down that I hadn't brought up in conversation and when she came over to examine me, so actually asked about, which shows an attention to detail I certainly haven't seen with most doctors. 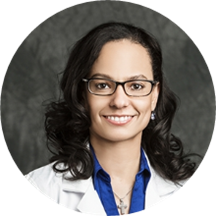 Dr. Carla Ward joined the Institute for Asthma and Allergy in June of 2014. She is board certified in allergy and immunology. A native of the Washington DC and Montgomery County community, she is from Gaithersburg, MD and completed her undergraduate and medical studies at the University of Maryland. Dr. Ward completed her Internal Medicine residency at the Beth Israel Deaconess Medical Center in Boston, Massachusetts. During this time, as a Clinical Fellow in Internal Medicine at the Harvard Medical School, she developed an interest in the field of Allergy and Immunology. She completed her fellowship in Allergy and Immunology at the University of Medicine and Dentistry of New Jersey. Prior to joining the Institute for Asthma and Allergy, Dr. Ward was in an allergy private practice in Tampa, Florida for eight years. She has published research in academic journals and has presented research at national allergy meetings. Dr. Ward is a Fellow of the American Academy of Allergy, Asthma and Immunology and of the American College of Allergy, Asthma and Immunology. Everyone was great, from the front desk on back! Thorough, efficient - would recommend. I absolutely loved my service with Dr. Ward and her entire staff. I had an insurance issue and was frantically trying to get it squared away, but her staff calmed me down and told me it would be taken care ofand not to worry. Dr. Ward's bedside manner was excellent as she's welcoming, knowledgeable, and extremely funny. I wholeheartedly recommend this practice. Dr. Ward was very professional and personable. She listened to my concerns and she explained the pros and cons of each treatment option. She gave me suggestions of things to do immediately to help my allergies. She is just terrific. Smart, helpful, nice. To the point. Everything I want in a doctor. My daughter saw Dr. Ward for an allergy evaluation. She was thorough and very professional, ensuring my daughter understood what was being done, and what her results meant. Dr. Ward has an amazing attitude and made the entire experience extremely pleasant. She explained everything thoroughly and to the best of my understanding, and sent me away with great information to treat my allergies. Would highly recommend!